So my son wanted to watch a horror movie, but he is not a fan of horror films. But he does like action and Marvel. So we decided on Blade. I have seen this one before and it is stupid fun. Vampires killing each other. Ancient vampire gods. Good times. 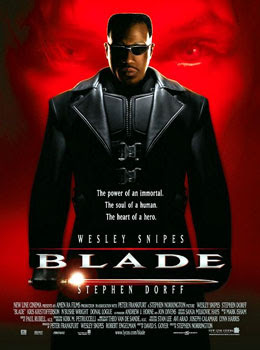 Blade is one of the few Marvel characters I still like. Maybe because he created by Marv Wolfman who would also be responsible for the New Teen Titans. A couple of points of interest. This is one of the very first "Cinematic Marvel Universe" movies, though I am not sure if it fits into it proper. Udo Kier is in this as the head of the vampire council. I think you can do a horror movie fest just on movies he was in. I might have to do that sometime.